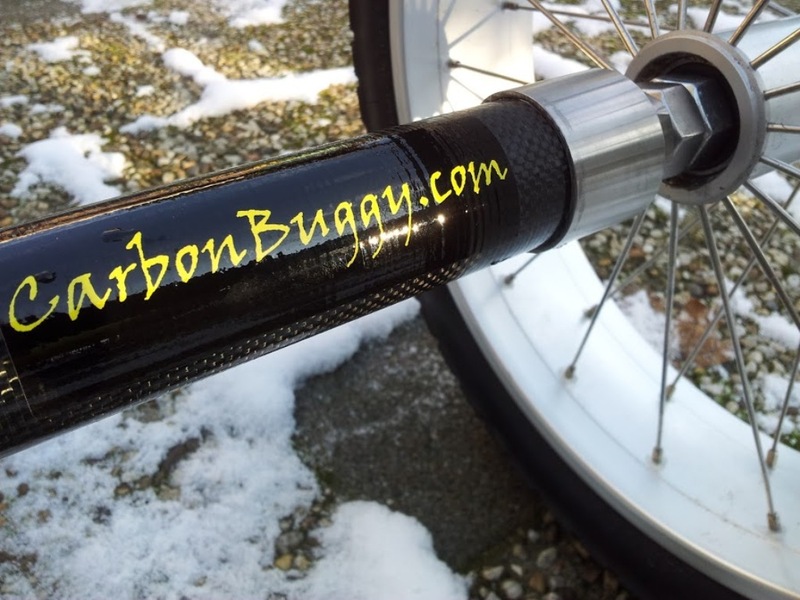 did a google search for carbonbuggy (looking for the hobbs carbon kite buggy site), but the first result to come up was actually CarbonBuggy.com and thought that some here may be interested. 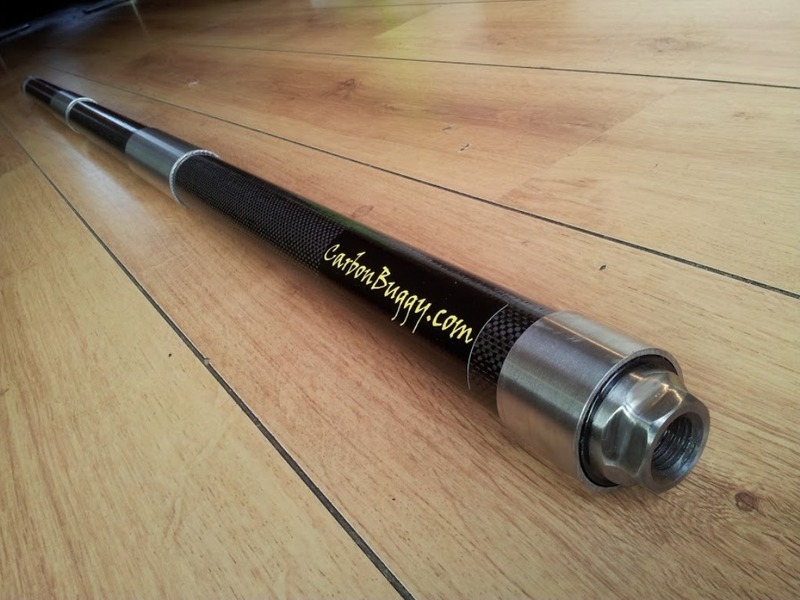 Its a guy in the Netherlands who is designing and building just the carbon fibre axles for kite buggies. He is actually the supplier of the carbon axles used by MG-kites, Xxtreme and GT-race on their buggies. 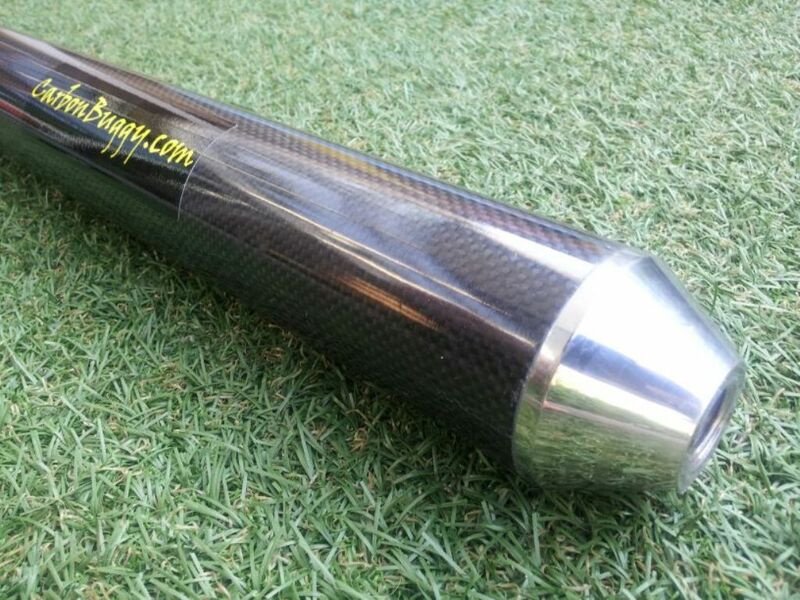 There is also the option to get a custom made axle. With the option to changing the length, wall thickness, and finish. 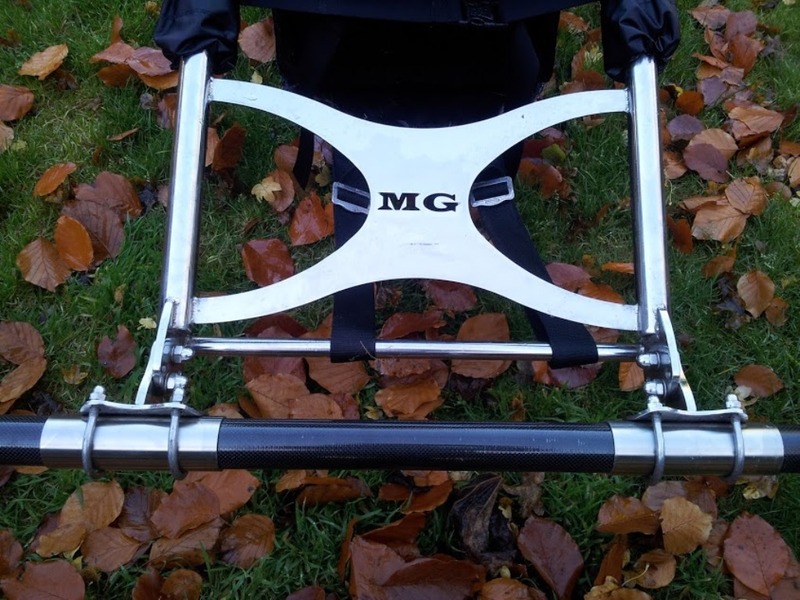 It looks like the only mount option though is a clamp type mount, but it wouldnt be difficult to make a mount so the axle could be used on other buggies like the libre or sysmic. The biggest question is, why? Fair enough if your racing in Europe, and they have weight limits for buggies, but no use here in Oz. Any weight saving is of no return for cruising down the beach. I agree Nigel, without a race scene theres no impetus for the high end materials and components. Whilst carbon axles might be justified for the jumpers, to save bending them permanently, it's just not going to make any impact as far as normal buggies go. The biggest improvement would be a faster kite, once you are running on full race kites, you may look into disc wheels and carbon axles, but if you're just cruising why would you bother. I'm under the impression that in reality, worldwide the buggy scene is very small potatoes, kitesurfing is where the dollars are for the kiting industry, they would have to outweigh buggies by a huge amount. Also my ride is a libre majestic, libre is well enough known, but again there's not many of them around, you might find about 4 or so on the Internet, so libre doesn't have a showroom floor full of majestics, they're most likely just made to order. This thread has piggybacked off from the Hobbs carbon thing, and in that thread, I said Australia was not a market, furthermore if he expects to sell 100s anywhere, it's not going to happen, unless it gives a SIGNIFICANT advantage in racing, in which case it will be copied by someone. It's a very very niche market. Clive, the benefit of a carbon axle on a buggy that is just used for cruising is that it adds a bit of suspension and makes for a smoother ride. You are correct that if your running Bigfoot wheels you will not notice any improvement in ride quality, as the tyres flex enough. But not everyone runs Bigfoot tyres. In fact I would estimate that 3/4 of buggys in Australia run barrow or midi tyres (Peter Lynn, flexi, libre, sysmic). All these buggies could benefit from a carbon axle to improve comfort. And as you said, there is no race scene in Australia, so a slight reduction in weight and traction isn't really going to negatively effect anyone. ... but but but, they just look so nice! I do wonder if they are UV stabilised, however if i did get one, i don't know whether i would rack up the hours to see any degradation. i wish i had the hours to buggy like i used to. Is that a quick release axle on the Apexx? If so, that looks like a great idea. Carbon axles do 2 things well. 2)they are stronger and don't bend. They will bounce back. Round axles like the pictures shown are no doubt the cheapest and easiest method to build an axle. But it is not the best method. The stainless gussets/bolting points are huge stress risers and the axle will fail at those points well befor it would if it was manufactured properly with tapering at the stress points. Don't freak out too much though. The carbon axle will last a lot longer than any stainless axle in the same service regardless of the poor design. The next issue is the movement of the axle. A round composite axle can flexes on all angles. up/down, back forward. The issue with this Is quite server axle tramp in certain instances. For suspension with limited axle tramp you only want the axle to go up and down. This can be achieved several ways. 1 is to mount sway bars going from the front or the buggy side rails to the end of the axle. It a cheap easy method to fix the problem. The better solution is to make a carbon axle that is a foil shape that will stop the forward flexing but allow the vertical flexing. But foil axle is expensive and difficult to buld. So you wont see it any time soon on production buggy options. Is anybody of driving a carbon axle and could have further advise on this? Is it worth it or should we just stick with the heavy metal one? I am using some Landsegler wheels, there are quite hard (1.1bar). I picked up a set of those beach wheels, yet haven't had a beach run on them yet. much lighter than the bigfoots. I have a fibreglass axle that is freaken fantastic. It has sweet flex that makes bumpy terrain so much smoother. BUT. It did flex forward and back aswell which caused axle tramp. That not good when you want to slow down at 70+kph. So.... I installed sway bars. Now the only movement is up and down. If you have smooth hard beach there is probably little advantage. If you have bumpy beach and or dunes that flexible axle is the way and the light. I use my carbon axle with big foots for weight reduction. Carbon axle and sysmic wheels create massive judder under sliding where the distance covered by the wheel not touching the ground could be a couple of meters. Thanks for the reply. Russel, do you feel insecure with carbon axle and the Sysmic wheels? Which pressure do you drive them? Do mean the tire in Lee is when sliding not touching the ground due judder (this would make braking more difficult, doesn't it)? So you won't recommend the carbon axle with thinner and harder tires as Landsegel or Sysmic? That's the forward and back movement of the axle. Install some sway bars like I have and the judder will be all but gone! It's the up and down movement. In a video I have I managed to catch someone doing the same in slow motion. It's the twist on the axle from the side loading on the wheel that makes it flex and skip over the sand. It's a personal thing I guess. I know the carbon is strong enough to work with disc wheels. But the way the snakeskin bite the sand, the carbon fibre flexes and does not give me the solid feel I like. I've raced with the combo and done OK. But It just doesn't feel right to me. The steel axle has no give so the feel while sliding is more consistent and positive. I may try it again sometime. But my current setup works fine for me. As @igeighty has said I've got the carbon axle, I've also got the stainless as well so I can choose whichever on any given day. On bigfoots I prefer the stainless axle, there's enough bounce in the beach racers that incurring more flex I think becomes counter-productive. On my Sysmic discs I prefer the carbon over the stainless, I find it's a much more comfortable ride especially over 60km/h when you start hitting un-expected patches on the beach. @socommk233's video above at 4mins shows his rear wheel moving a bit on the slide. 1) I haven't noticed this when sliding however I haven't had rear-view footage like that. Russel seems to be a bit of a kite-photo ninja lately with the angles and video he's producing ( https://www.instagram.com/buggy_pilot_k233/ ) I'll mount a camera next time looking back at the axle as that would make for some interesting footage. 2) There is some movement in the back axle, but I think that comes from the way it's mounted to the buggy and not so much the carbon itself. 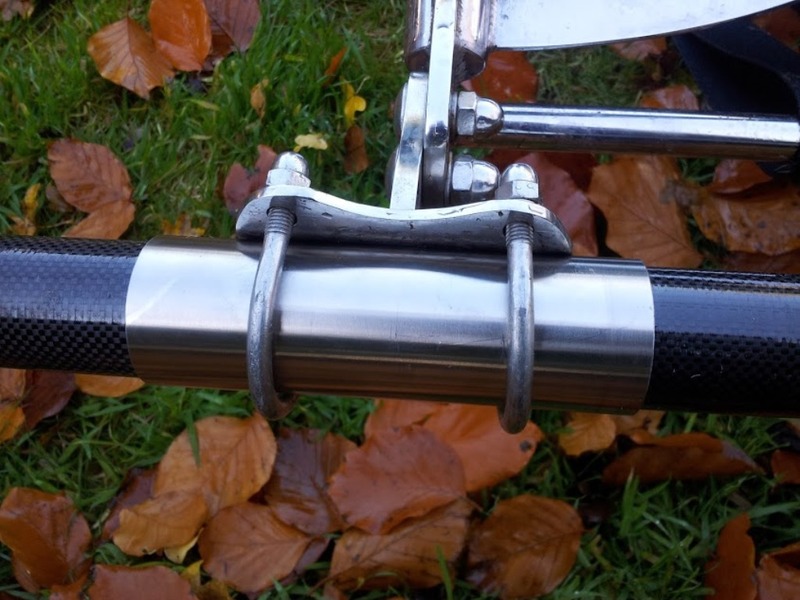 There's rubber inside the axle clamps that join to your side rails, you need to make sure these are done up fairly tight otherwise what @plummet describes as "axle tramp" of the wheel moving towards your fork and backwards again can be achieved by hand flexing the back of the buggy. I noticed this when I was playing around and didn't have those clamps done up tight enough. Since properly tightening the back clamps the whole buggy stiffens up properly like on the stainless axle. My production buggy "minimax " comes std with a 50 mm x 4mm wall carbon axle. 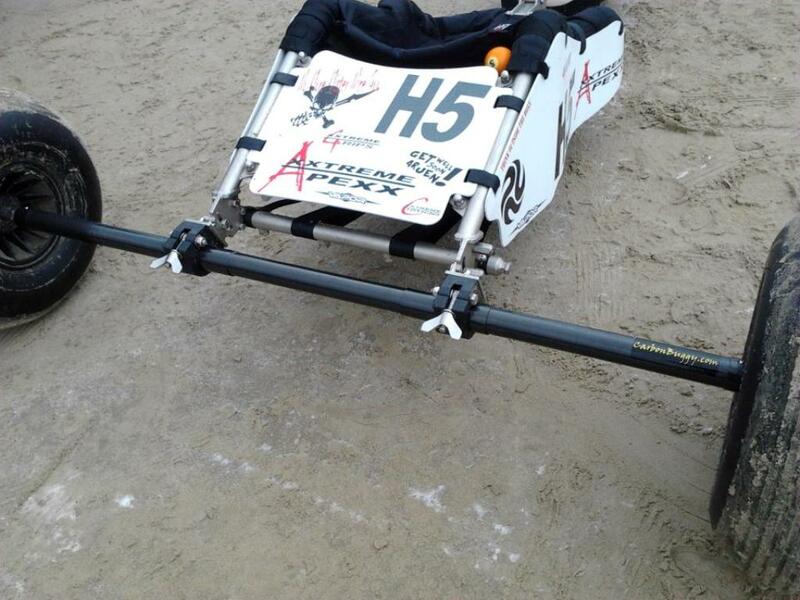 This buggy is built as a all rounder, but the main thing it is good for is working the dunes. This is where s/s fails and carbon just bounce back for more. As I give a life time warrant on the buggys the s/s axles were costing me more than the carbon axle. Photo is from the "project chook" album yet to be posted. Oh I know exactly what it its. That's exactly what used to happen to my buggy (except a lot worse) until I put the torsion bars on. If you want to fix it and have a better performing buggy then fit some torsion bars. What you could do as a test is cut a couple of broom sticks and ducktape them to the axle and frame. See if its better.